Will a creatures activated/triggered ability resolve if the creature gets killed in response? CMC of Flip and Meld cards? Do Conspiracy and Vildin-Pack Alpha interact? TheEDHKid on Suggestions For Thromok the Insatiable? I noted that this is excluded & I'm sure there's good reasoning for it: Defense of the Heart . 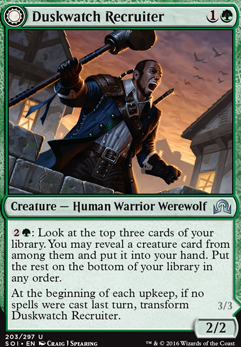 Though this card is vulnerable it fetches a busted level of advantage, is tutor for two permanents and puts them into play. 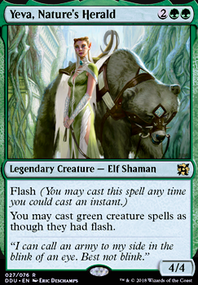 A sweet value option could be Seedborn Muse & Duskwatch Recruiter Flip / Great Oak Guardian & cat to close a game. Also - a note: you use the Quirion Ranger tact, but no Burgeoning ? 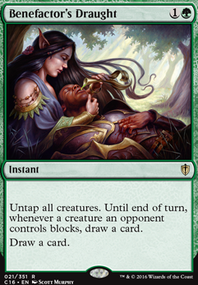 On it's own is ok - providing that early game fast mana for your powerful t2, and in conjunction with bouncers that untap you can gain great mana advantage without sacrificing speed. Soren841 actually pitched it to me, but we both came to terms that it is a worse Duskwatch Recruiter Flip. If Yisan were that centric, I would consider it. 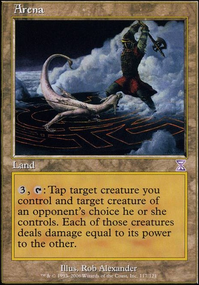 But if you have to discard lands from the hand to finish the loop, as per the example I gave, it means your doing something besides looping the same thing. You have to deviate. 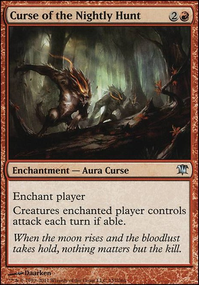 Compare that to Duskwatch Recruiter Flip, which does not require any other actions besides activating its ability over and over (given unlimited mana). Loops that can be shortcut are loops that get you from point A to point B, without doing anything else. There seem to be cases in the Gitrog combo, where that is not the case. If it is so, even though there is no way to "fail", there should not be a way to shortcut it. lukas96 i don’t get what you are saying. 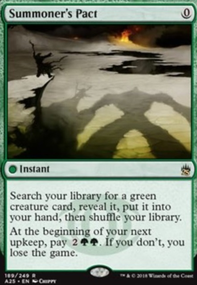 When people activate Duskwatch Recruiter Flipand reveal zero creatures, but have infinite mana, does that mean they still have to “play it out”? 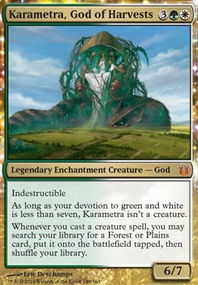 As long as you have the combo and any other land, your deck gets put into hand. If you don’t trust me, go home and try it out. The deck gets put into hand every game, which means you can shortcut it.